When a Platform Game uses gameplay mechanics borrowed from the Shoot 'em Up genre. Or a Shoot 'em Up with platformer elements, that works too. Also known as Action Platformer. It is characterized by its hordes of vicious enemies who — unlike most regular platformers — cannot be harmed by Goomba Stomping them, long-ranged weaponry (distinguishing it from Beat 'em Ups) that can — despite the name — be something other than Cool Guns, Bottomless Magazines, and various Power Ups changing the weapon or its function. Expect a Spread Shot as a weapon type to deal with swarms of Mooks. Close combat moves are sometimes available, which could bring the game closer to the Beat 'em Up genre, which is also about going forward and beating up bad guys. Although previous examples existed before, it was mostly codified during the NES era where various popular titles like Mega Man and Contra generated tons of clones with various degrees of success. Because of this time period, games like this are expected to be Nintendo Hard. The genre is a staple of 2D video games as it never really successfully passed the Video Game 3D Leap, although one can argue that it stealthily evolved into the Third-Person Shooter genre (thanks to games like Cabal and Wild Guns) and Hack and Slash (which is historically a cross between Third-Person Shooter and Beat 'em Up, but some also include platforming sections and firearms). 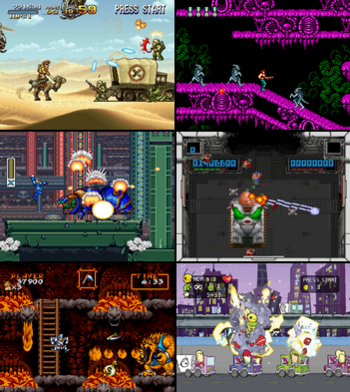 Platformer subgenres like Platform Fighters and Elimination Platformers could also be considered run-and-gun games if they mostly focus on gunplay and/or range combat. It should not be confused with Metroidvania, a close cousin more focused on adventure and exploration with light RPG Elements and the opposite side of the Action Platformer genre. In Run-and-Gun, RUN is the key word. It implies moving forward and not looking back which can be enforced by a Ratchet Scrolling, and going for a more traditional linear level structure with one-hit-and-you-lose-it power-ups to emphasize the feelings of stress and urgency, where Metroidvanias offer an open world filled with locks and permanent upgrades unlocking those locks. It's not absolute though, and some games are able to balance the two by borrowing some mechanics from the other side. But it should be clear: having a gun in a platformer doesn't necessarily turns your game into a Run-and-Gun. Note that Run-and-Gun is also a name given to Shoot 'em Up games with a top-down perspective where players can control a character or a grounded vehicle (contrasting the usual Space Fighter, usually a tank) with a 360 degrees liberty of movement, unlike traditional Shoot 'em Ups which lock the facing of the shooter in a single direction. The Trope Codifier of this specific genre from The Golden Age of Video Games should be Commando, and the success of The Binding of Isaac brought a wind of fresh air to the genre by adding Procedural Death Labyrinths into the mix. Do not confuse with the game Run 'n' Gun, nor with Do Not Run with a Gun (a piece of advice that is largely ignored here). Also not to be confused with the tactic used in the sport of Basketball. Awesomenauts is a run-an-gun MOBA. Castlevania before receiving a genre creating shift inspired by Metroid starting with Castlevania II: Simon's Quest and completely embracing it with Symphony of the Night. Its categorization as run-and-gun is anbiguous in the first place, as the protagonists mostly use their whips and the ranged attacks are in very limited quantities. Contra (a.k.a. Probotector) and its numerous sequels. Duke Nukem before shifting to First-Person Shooter starting with Duke Nukem 3D. Elevator Action depending on the title. Certain games are more puzzle-focused although you still shoot enemies, while others focus on the shooting and platforming. Ghosts 'n Goblins is a run-and-gun, despite its Fantasy aesthetic, as most of the weapons are long-ranged. Gunforce 2, notable for being the spiritual predecessor to Metal Slug but plays more like Contra. Kid Icarus is almost a Metroidvania, but the lack of backtracking forbids him to be considered that. Kid Icarus: Uprising is one of the rare examples of 3D run-and-gun. Mega Man is somewhere in-between run-and-gun and Metroidvania, as the Power Ups received during the game aren't temporary and can sometime be used to access specific places in the levels. Some of its sub-series continued this crossed genre, but Mega Man ZX is however a complete Metroidvania. Mega Man Zero might be the last extreme from this franchise to be considered a run-and-gun before being called a Metroidvania, with its central hub leading to linear levels and permanent upgrades. The Mighty Switch Force! series, mixed with Puzzle Platformer. Pulseman, although the gunplay is rather downplayed. Vectorman and its sequel, Vectorman 2. Ikari Warriors is often described as a run-and-gun game despite not being able to shoot in multiple directions, mostly due to the fact that you control an on-foot soldier which was mostly unseen at the time. Cave Story is very much a Metroidvania. However, its mechanic of dynamic upgrade/downgrade of Quote's weapon thanks to enemy drops are inspired by traditional run-and-gun games. The level "Honeycomb Starway" from Super Mario 3D World is a Shout-Out to traditional Shoot 'em Up games, with its top-down view, Auto Scrolling, and lines of flying enemies defeated thanks to the boomerang Power-Up. Super Mario Maker allows the creators to take the classical Mario formula and turn the action Up to Eleven by throwing tons of power-ups and enemies at the player. One particular trend was to use the Koopa Clown Car and a Flower Flower to give to the game a Shoot 'em Up flavor. Nintendo noticed it, and later included a fire-shooting Clown Car in an update. A quick shot ◊ of an Inkling in a seemingly run-and-gun retraux Mini-Game was featured in an early Splatoon trailer, but there is no trace of it in the actual game. It is unknown if this was just an early concept of the actual retraux mini-game presnent in the game or if it was only supposed to be a stylized scene made only for the trailer. The Puzzle Platformer series Trine has a very slight run-and-gun vibe at some points with its occasional waves of enemies and long-ranged attacks you could unlock, though permanently. The hunting sections of The Oregon Trail could actually be considered the Ur-Example of overhead view run-and-gun games. Parody games like Organ Trail and Super Amazing Wagon Adventure still feature them. In some respects, the Ratchet & Clank series could be considered a 3D run-and-gun due to the focus on crazy gun fights, unlike its two Sony platformer brothers Jak and Daxter and Sly Cooper even though they both started to integrate gunplay in their sequels. Up Your Arsenal also features a series of Mega Man-like Games Within a Game starring Captain Qwark. One of the arcade machine in Overwatch's level Hanamura is named Siege Mode 3 and looks like a Metal Slug-like run-and-gun featuring characters from Blizzard's StarCraft franchise.